Eclipse Of The Sun: Did You Fall Into The Ring Of Fire's Path? : The Two-Way For much of the western U.S. and Asia, the rare celestial event was quite a show. Were you in its path? 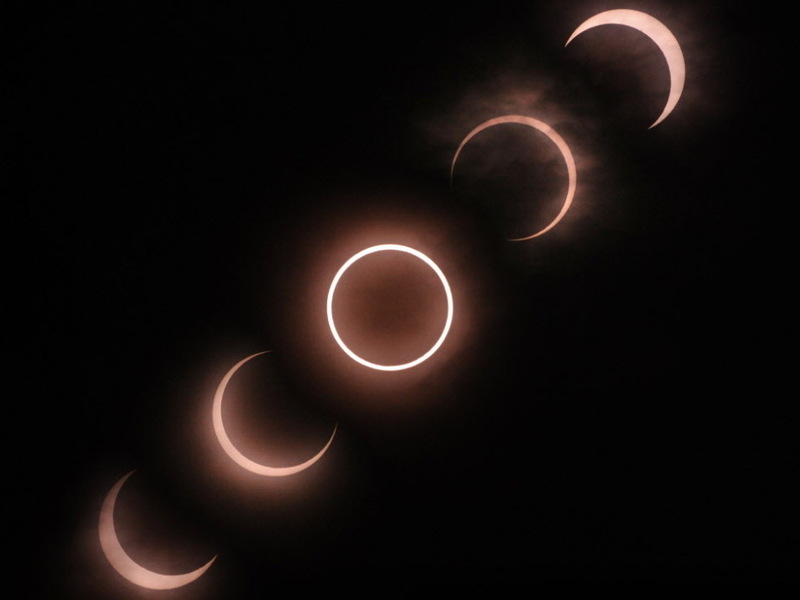 This combination picture shows the annular solar eclipse as viewed from Tokyo earlier today. "Viewing parties were held in Reno, Nev., Oakland, Calif., and elsewhere. In some parts of the U.S., special camera filters for taking photographs have been sold out for weeks in anticipation of the big event. People from Colorado, Oklahoma and as far away as Canada traveled to Albuquerque to enjoy one of the best vantage points." And in Japan, "the eclipse was broadcast live on TV in Tokyo, where such an eclipse hasn't been visible since 1839. Japanese TV crews watched from the top of Mount Fuji and even staked out a zoo south of Tokyo to capture the reaction of the chimpanzees who didn't seem to notice." Japan's NHK-TV says the eclipse thrilled "observers across the nation." The next time such a event will be visible in Japan, it adds, is in the year 2312. On Morning Edition, Oregon Public Broadcasting's Amelia Templeton reported about the excitement the eclipse generated across the west. As MSNBC adds, the eclipse became a global social (media) event. NASA is collecting photos of the eclipse on its Flickr page. If you were in its path and saw the show, tell others about it in the comments thread. For those who plan ahead, the Los Angeles Times looks at when the next solar eclipse will be visible from the U.S. It says an Aug. 21, 2017, "total" solar eclipse "is the one to travel for." That one "will glide through Oregon, Idaho, Wyoming, Nebraska, northeastern Kansas, Missouri, southern Illinois, western Kentucky, Tennessee, the Great Smoky Mountains National Park and South Carolina."